These headphones can’t fall out of your ears or irritate them while you’re exercising. 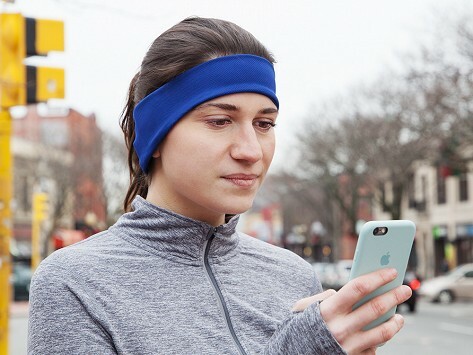 That’s because the two speakers are tucked inside a stretchy, moisture-wicking headband. Place over your ears, and you’re ready to listen as you run or work out while streaming music via Bluetooth. A small control panel is built in as well, letting you turn your headphones on, adjust the volume, and more—without taking them off. Dimensions: 10" x 3" x 0.5"
Gave these to my commuter son for Christmas. He says they work really well. I ordered these, and they are the best headphones for walking outside. They are very safe for travel on the road. With their headband headphones, AcousticSheep lets you listen in comfort, courtesy of two interior speakers. No earbuds sticking in (and out) of your ears. Use these speakers inside stretchy material in bed or while exercising. One version even lets you hear the TV without disturbing your partner. Adjust the volume, skip tracks, and more—without taking your headphones off. Doctor Wei-Shin Lai created these comfy headphones after one too many middle-of-the-night calls from patients. She had trouble getting back to sleep, so she tried relaxing with some music. But her uncomfortable earbuds kept her awake. AcousticSheep makes different styles to suit whatever you’re going to use them for—each a little different in its features. But whichever headphones you choose, they are all easy on the ears.